It is with great sadness we learn of the passing of Mick Carley, one of the club's and county's finest ever footballers. Mick was part of our famous 3 in a row side that won county senior titles in 1968, 1969 and 1970 and was captain when 2 more titles were added in '72 and '74. 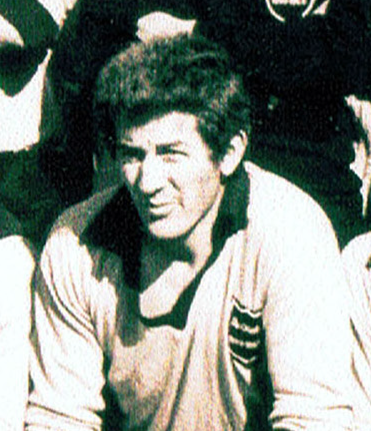 At inter-county level, Mick made his senior debut in 1957 and later linked up with fellow club man Dom Murtagh forming a formidable midfield partnership for Westmeath. Mick had the distinction, shared by only two others, of lining out for both the Westmeath minor and senior teams on the same day in the Leinster Championship, a feat he achieved in 1958. Louth provided the opposition for Westmeath in both games and Mick played both at full back. in 2011, Mick was presented with the Mullingar Park Hotel/Westmeath Examiner Sports Stars ‘Hall of Fame’ award. The club were honoured to have Mick and many of his former team mates present in the clubhouse on 24th November 2018 as we celebrated 125 years and the launch of our club history book. Here's just one of many treasured photographs we have from the night (Mick is 3rd from left) along with Brian, Christy, Dom, Jimmy and Seamus. We extend sincere sympathy to the Carley family at this time and also to our fellow gaels at Tyrrellspass GAA Club.